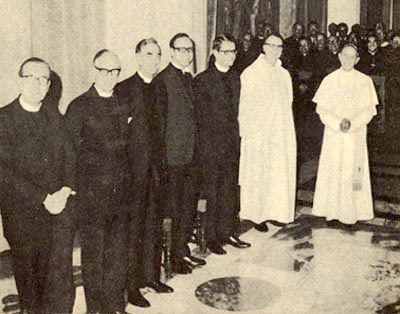 Paul VI posing with six Protestant theologians who were part of the commission encharged with writing the New Mass. These Protestants were invited by Paul VI in order to make sure that nothing in the New Mass would shock their heresy. It is not surprising that the resulting Novus Ordo Mass has the flavor of Protestantism, which means the taste of heresy. John Paul II Kisses the Hand of Rowan Williams, Head of the Anglican Sect.